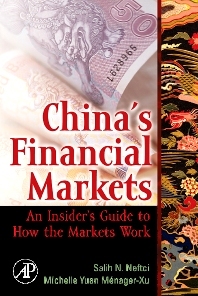 China’s financial markets represent about $2 trillion and are expected to grow to about $10 trillion by 2008. As these markets continue to open to outside investment, a thorough understanding of how they operate will be essential for success. In this book, Salih Neftci, an expert in finance whose teaching and research span North America, Europe and Asia, and Michelle Menager-Xu, a Chinese finance professional currently working in Geneva, bring together an unprecedented collection of Chinese insiders who are experts in their respective industries. These experts provide a detailed description of the banking system, the money, equity, futures, FX, and bond markets, the insurance sector, the mortgage market and mortgage instruments, and the regulators. Readers will learn how each of these financial sectors operates, how the government, regulators, and the central bank are involved, each sector’s history, size and projected growth, an analysis of its current situation and discussion of future trends, the major players, and how the game is played. This is a must-read book for financial success in this emerging market. Finance professionals worldwide in: equities, bonds, insurance, currency exchanges, and the futures markets. Business development heads in corporations looking to expand into Chinese markets; portfolio managers and other investment professionals managing or creating funds invested in Chinese instruments; MBA students in finance and international business programs. Chapter I: Introduction. This chapter will summarize the book and put it in a context. . Chapter 2: The structure of the Chinese banking system. Chapter 3: Chinese money markets. ¡ Deposits ¡ Loans. ¡ A discussion of special aspects of the practices related to these basic instruments. ¡ A brief summary of various types of deposits and loans. ¡ Inter-bank market in China. ¡ The role of the foreign banks and the future prospects. ¡ The coming reforms and opportunities. 5. Chapter 5 Futures markets. Chapter 6 The FX market. Present and the Future. Size of the mortgage market. Who are the main players? Where is the main market? Mortgage backed securities and the future of the sector. Mortgage backed securities and the future of the sector 4.1 Current situations 4.2 How the future will be 4.3 What Chinese is doing/ should do to be ready for the future? Professor Neftci completed his Ph.D. at the University of Minnesota and was head of the FAME Certificate program in Switzerland. He taught at the Graduate School, City University of New York; ICMA Centre, University of Reading; and at the University of Lausanne. He was also a Visiting Professor in the Finance Department at Hong Kong University of Science and Technology. Known his books and articles, he was a regular columnist for CBN daily, the most influential financial newspaper in China. Michelle Yuan Menager-Xu graduated from the School of Business, University of Lausanne, Switzerland. She holds Master’s degrees in both Actuarial Science and in Banking & Finance. Michelle is an associate of the Swiss Actuarial Society, and has worked at various consulting firms and in insurance and reinsurance companies in both Switzerland and China. Previously she worked at Swiss Reinsurance Company in Zurich, Switzerland, and was in charge of business in the China Region (Mainland, Hong Kong, Taiwan and Macao), including risk management, reserve issues, and various insurance and bank-insurance product pricing. Currently she is writing her Doctoral Thesis at the Institute of Actuarial Science, Lausanne University. Her research focuses on applications of swaption pricing theory to surrender options found in insurance contracts. Her research areas are: risk management, FX market, Fixed income, financial engineering and tourism economics.